The backdrop is a sight to behold, a UNESCO World Heritage Site under two categories , nature and art. It’s one of only a few UNESCO sites in the world that qualifies for more than one category!- so this place should be special. At the height of construction in the 14th & 15th centuries, some 24 monasteries inhabited the peaks. Their whole ethos was one of remoteness and inaccessibility. The political instability of the era, rather than an overwhelming desire for the solitude of spiritual contemplation made isolation a necessity at the time. 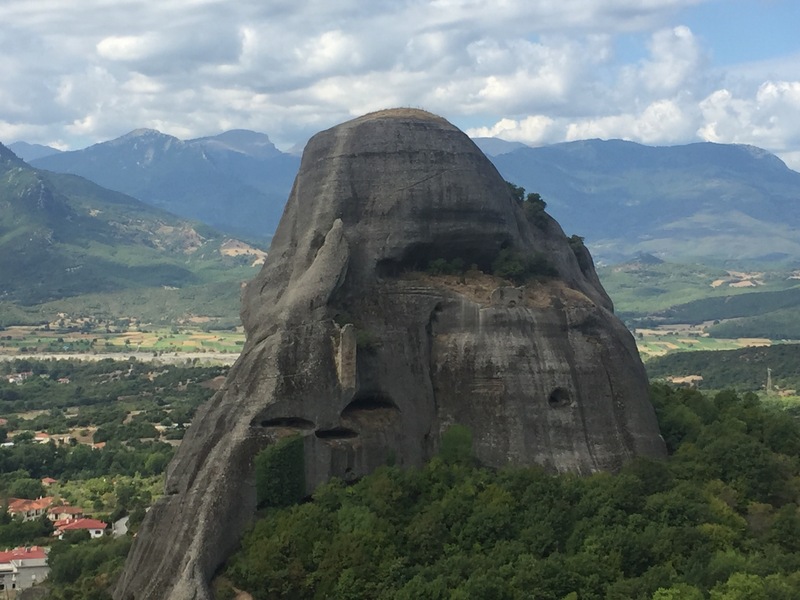 Today you can drive to the six main monasteries, The road was built in the late ’70s, at a time when Meteora was unknown to most of the outside world. That would change in 1981, however, thanks to Britain’s most famous spy. Probably the first view any of us had of this epic place, Was the climactic scene at the end of ” For Your Eyes Only,” Bond has to steal back the Automatic Targeting Attack Communicamcguffin from “St. Cyril’s.” The fictional St. Cyril’s is the real life Monastery of the Holy Trinity, the most amazing real-world Bond villain lair. 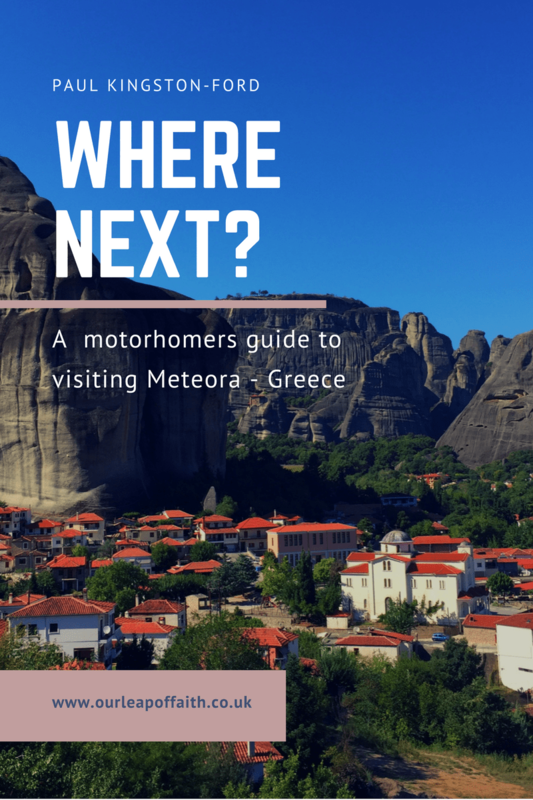 If you enjoyed our first ebook on Bulgaria, here’s the next in the series written while here in Meteora….. So once you have seen the monasteries what else can you do ? Most are difficult to impossible to find on your own as there are no signs. 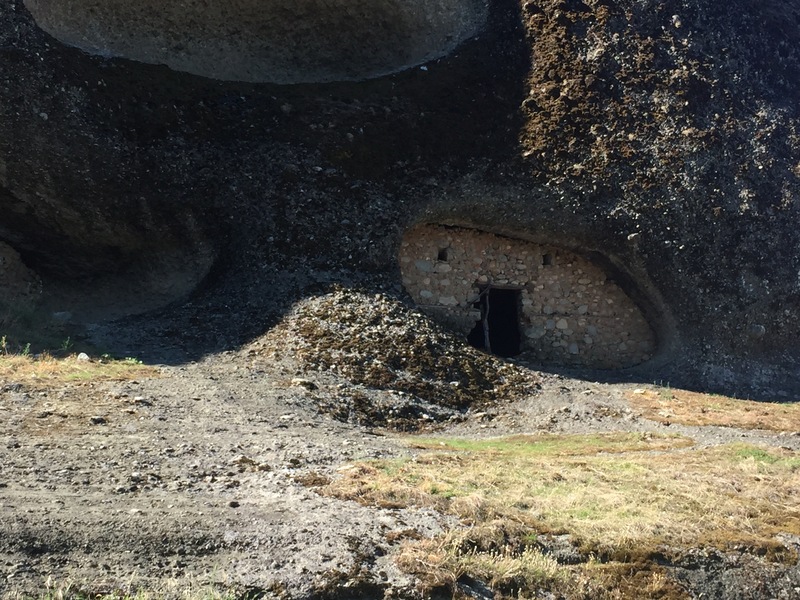 Pictured above is one of the long abandoned hermit caves on the Rock Forest Hike! 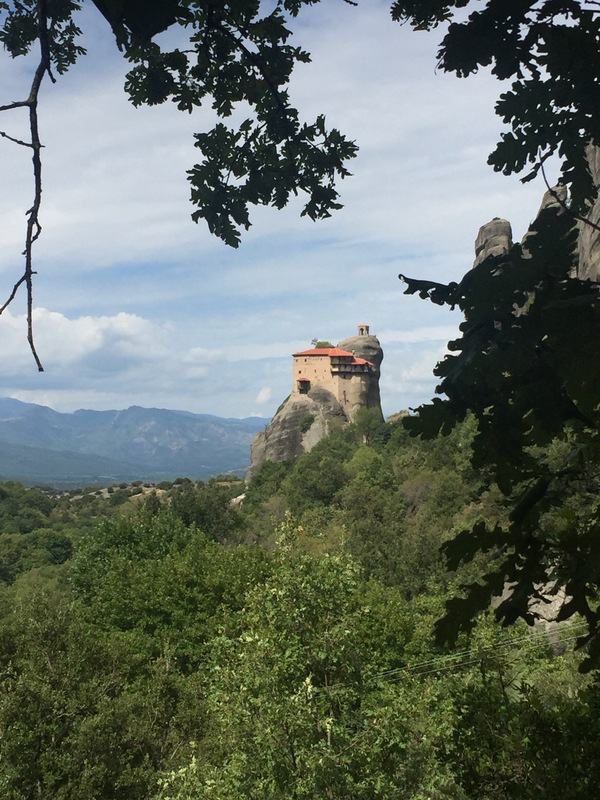 St. George is the most famous hermitage site in Meteora and the easiest to find. 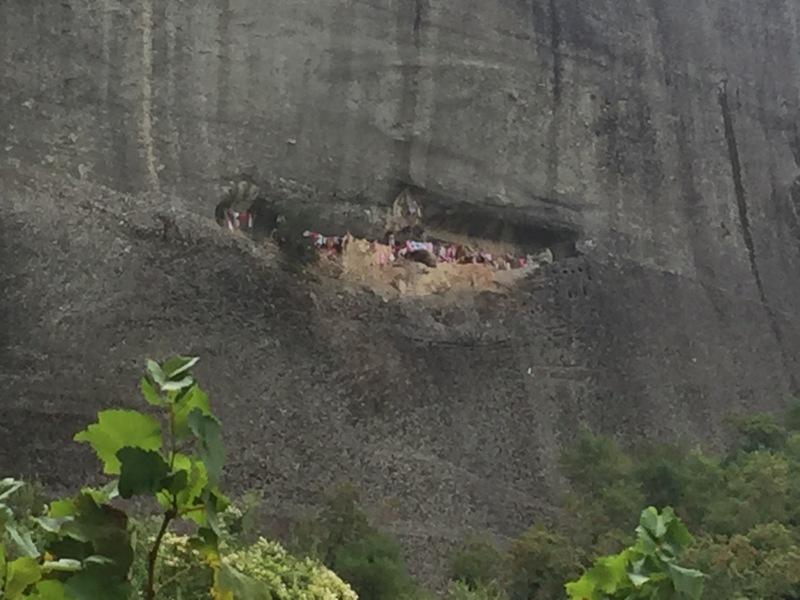 To symbolize that act of donation honouring Saint George, believers hang colourful scarves once a year on a rope supported by trees, near the cave’s entrance. Young men from the neighbouring village participate in an annual climbing competition and carry down the old scarves which they then keep at home as a token of good health. 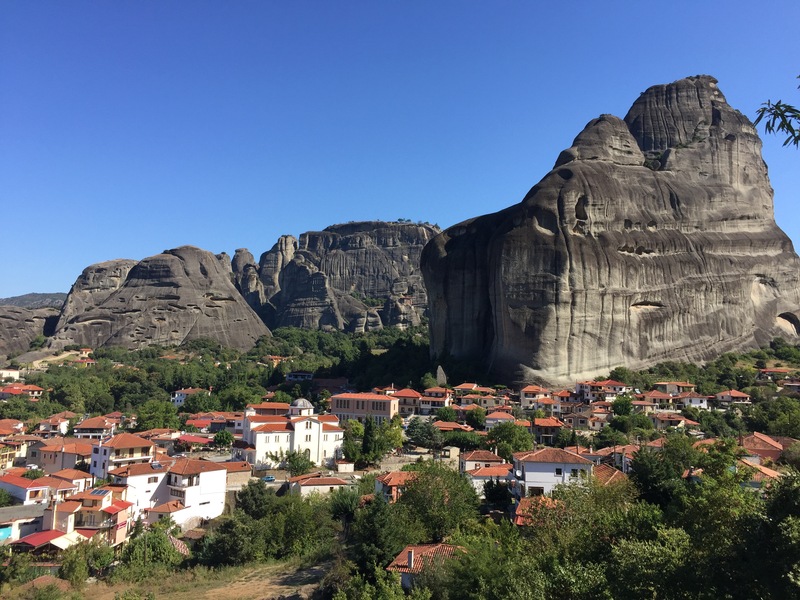 We loved Meteora too, it is much more stunning than I could have dreamt. Thanks for the blog post and happy travelling.